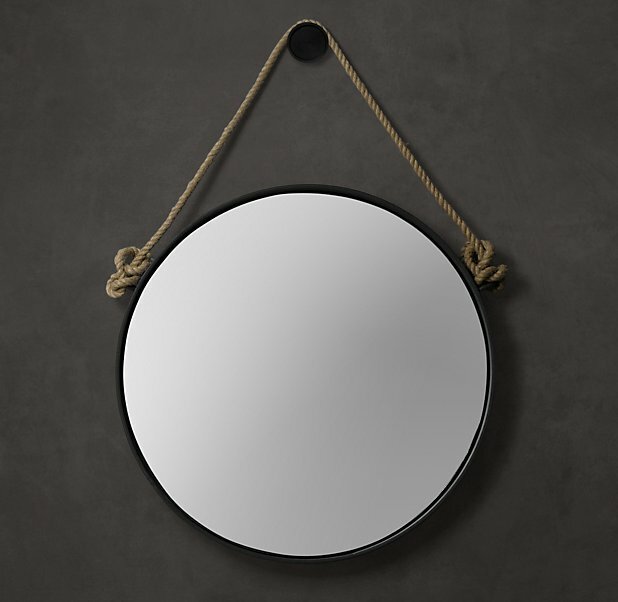 I love love love Restoration Hardware’s Iron & Rope mirror, but I could in no way afford it’s $650 price tag (sad face). Apartment Therapy even showed an Ikea hack version a few weeks ago. It looked cool, but it was lacking the black metal element. What makes the Restoration Hardware mirror so fab is the contrast in materials. 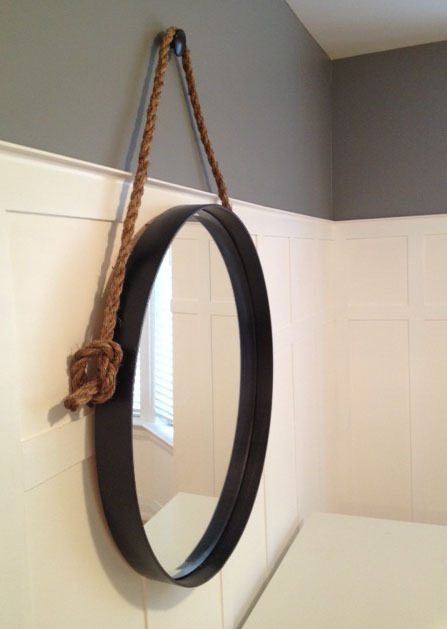 The pristine polished look of the mirror, mixed with the hard iron and the rough rope. 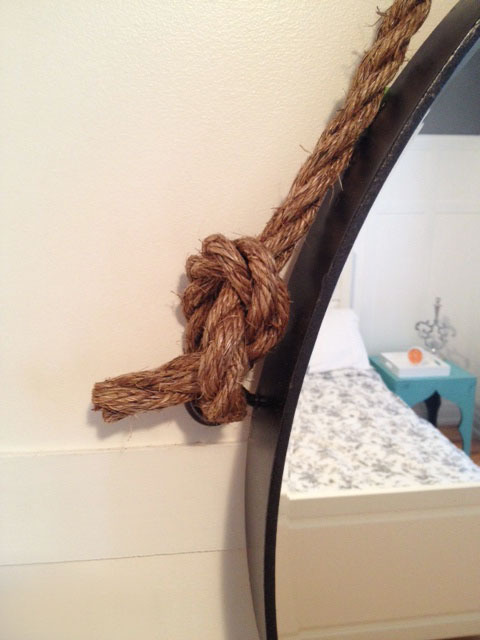 I also didn’t like that the rope wasnt attached to the mirror at all int he Apartment Therapy hack. The hooks and rope were screwed into the wall. I wanted the RH look, but at a budget price. I had a round mirror hanging around. Literally; it had been pulled off the wall in the powder room a year ago, and had been shuffled room to room since. It was currently leaning against the wall in the guestroom. 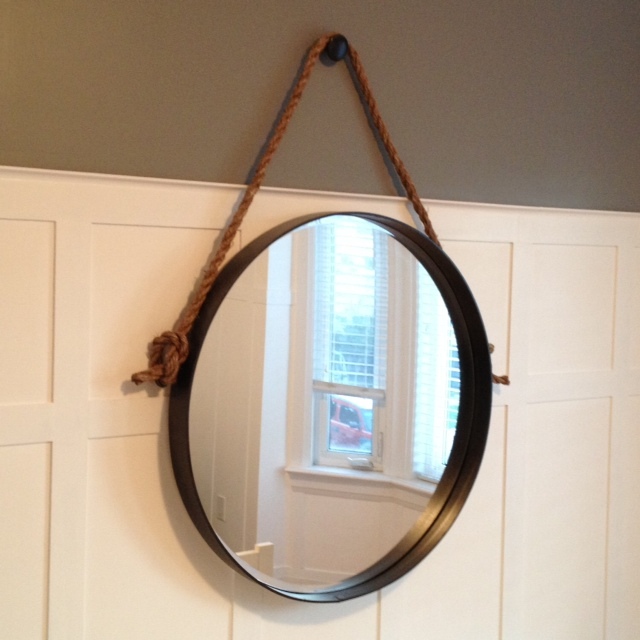 I thought I would give a go at making my own RH Iron & Rope mirror. What did I have to lose? So I grabbed the mirror (an Ikea Kolja mirror in 75cm size). I traced the mirror outline onto a piece of plywood that we had laying around the garage. El Granto cut out the plywood using a jig saw, and I sanded the edges. This made a perfectly round piece of plywood the exact same size as the mirror, and it would be used as the base for our mirror frame. 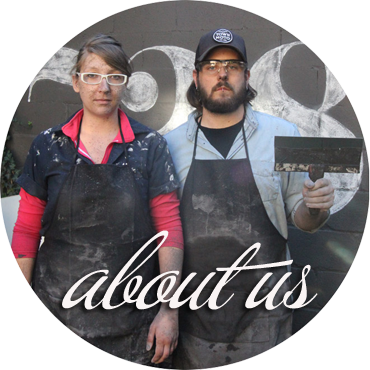 I grabbed an extra piece of 1/4″ mdf that we had from the guest room board & batten project. It was already cut down into a 2 1/2″ strips, and it looked about the right size. 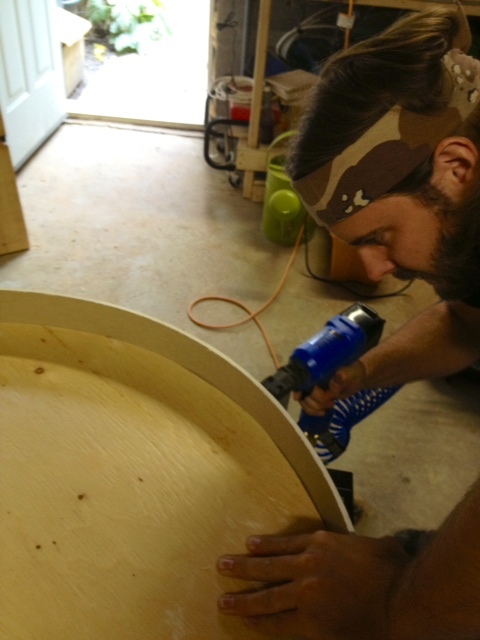 We dry fit wrapped the mdf around the outside of the plywood circle and marked it for length. 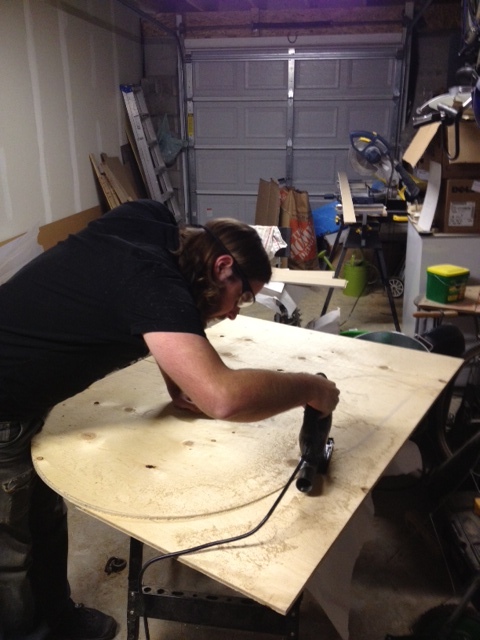 We cut it to size with the miter saw, then broke out the brad nailer and went to start nailing it onto the plywood. That was when I got a bit too excited and snapped the mdf right in half. OOPS! Time to grab another piece of mdf, re-measure and cut to length, and try again. We nailed in one end of the mdf with 1″ brad nails, then proceeded to bend and wrap the mdf around the circle nailing every inch or so. It was not too hard until we got near the end, when the mdf did not want to bend the final few inches. We used all our muscles, and forced it around and nailed away, but it just wouldn’t stay nailed in. So we grabbed a screw and a washer and screwed in the very end of the piece of mdf, and overlapped the washer to the other end of the mdf. That way neither ends of the mdf could ever decide to pop out. We then stepped back, patted ourselves on the back and got to wood filling the nail holes and the seam. One thing about mdf is that it’s cut edges are not as smooth and nice as its flat surfaces. To counter this and make it look pretty, we sanded the mdf edge and spread on some spackle, let it dry, then sanded to a nice smoothness. 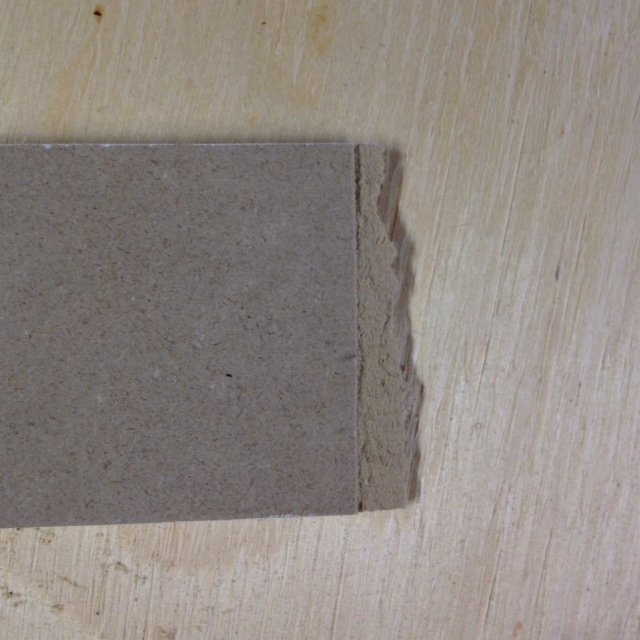 This is a great trick for getting a smooth finish on mdf edges. We pre-drilled holes for the eye hooks into the mirror frame, and then painted the frame using two coats of BIN primer and 2 coats of Oil Rubbed Bronze spray paint. 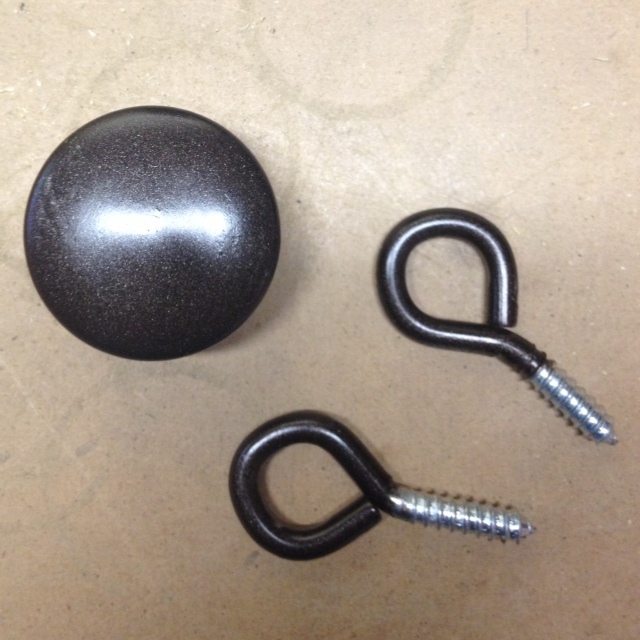 We also gave the knob, and eye hooks a couple coats of the same paint. After everything had dried, we installed the mirror hanging kit onto the back of the mirror frame, screwed in the eye hooks and used PL Premium construction adhesive to adhere the mirror to the plywood. After it had cured for 24 hours, we set to installing. We hung the mirror on the wall, then we hot glued a nail into the hole in the knob (so it could be nailed into the wall). 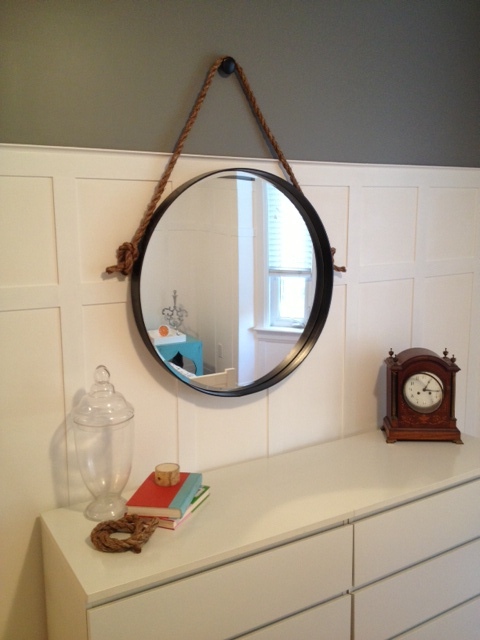 We hammered the knob into the wall about 1.5′ above the mirror, and then put the rope over top of it, then tied it around the eye hooks on the mirror. I would love to purchase this item!!! We saw a few online but when we went to order it they would not deliver only ship to store. Unfortunately the closest store is 2 hours away from us. Would you consider making the item again and selling me it? I actually like yours better I like the tan looking rope better.and $650.00 is ridiculous squared. very good !! LOVE LOVE LOVE this, it looks awesome, I love that it's big. I've seen some that are make from a cake pan, but I like statement! I bought an imitation version of the Loft 36" Round Mirror from Room and Board so as soon as I saw this I thought Oh look it has a friend! 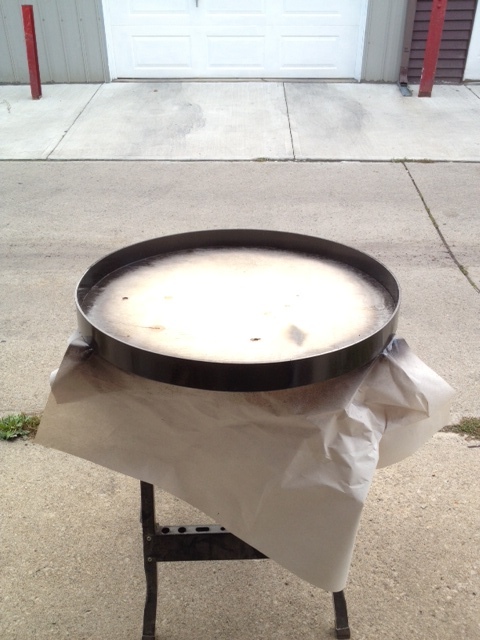 just went by the Resto Hardware Outlet in Halton Hills on Sunday, they've got one of these for $ 421 after all discounts! How was the outlet? I'm excited to check it out! not as good as American Premium Outlets (Grove City/Woodbury/Philadelphia/even Waterloo). Resto Hardware was the only thing I found interesting. Most stores' discounts were not that great and there weren't a whole lot of stores. Seems like the operator maybe just testing the market or something. Maybe it's busier than it will normally be because it's new and a novelty, but the parking lot is too small.